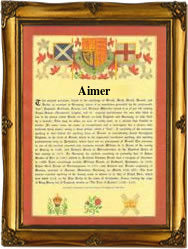 This interesting and long-established surname is of Anglo-Saxon origin, and derives from the Middle English male given name "Ailmar", itself coming from the Olde English pre 7th Century "Aethelmaer", a compound of the elements "aethel", noble, and "maer", famous, which was reinforced after the Norman conquest of 1066 by the introduction of "Ailmer", from a Continental cognate. "Ailmar, Aeilmar, Eilmerus, Aimar, Almer, Elmar" and "Elmer", recorded without surname in the Domesday Book of 1086, show the many early forms of the name. Godwinus filius (son of) Elmari was noted in the Winton Rolls of Hampshire, dated 1115, and an Ailmerus le Bercher appears in the 1212 Curia Regis Rolls of Hertfordshire. Early examples of the surname include: Roger Ailmar (Warwickshire, 1221), and Adam Aylmer (Cambridgeshire, 1273). In 1353, one John Aylmere was rector of Ingworth, Norfolk, and John Aylmer (1521 - 1594) was tutor to Lady Jane Grey, and bishop of London (1577). A distinguished bearer of the name was Matthew Baron Aylmer, commander in chief of the navy (1698) in the Mediterranean, and commander-in-chief of the fleet, 1709 - 1711. Two early Coats of Arms are held by the Aylmer family of County Kildare, who settled in Ireland after the Anglo-Norman Invasion of 1170, but that most associated with the name is described thus: "Or, on a cross engrailed between four martlets sable, five bezants within a bordure gobonated purple and argent". The first recorded spelling of the family name is shown to be that of Henry Ailmer, which was dated 1208, in the "Curia Regis Rolls of Berkshire", during the reign of King John, known as "Lackland", 1199 - 1216. Surnames became necessary when governments introduced personal taxation. In England this was known as Poll Tax. Throughout the centuries, surnames in every country have continued to "develop" often leading to astonishing variants of the original spelling.